After spending many hours on this site drooling over all the amazingly beautiful work, I decided to try making some LS7 style wraps myself... they are only a few but I am thinking of making a full set of normal dreadies and using these for accents sorry for the pic being a bit fuzzy!! Last edited by .::CirCuit::. on Fri May 13, 2011 9:38 pm, edited 2 times in total. ANIMALS ARE CHILDREN TOO! LOVE THEM, DON'T ABANDON THEM! Re: First Attempt at LS7 style Wraps!! NEW-B! "Distant beavers sound the alarm"
"Its not stylish if you look witty." oooh, really nice! Its hard to tell the colors a bit from the pic, its pink with blue, blonde/yellow, and purple it looks like? Very pretty! I know the colors are hard to see, I think the lighting in my place pretty much murders color! 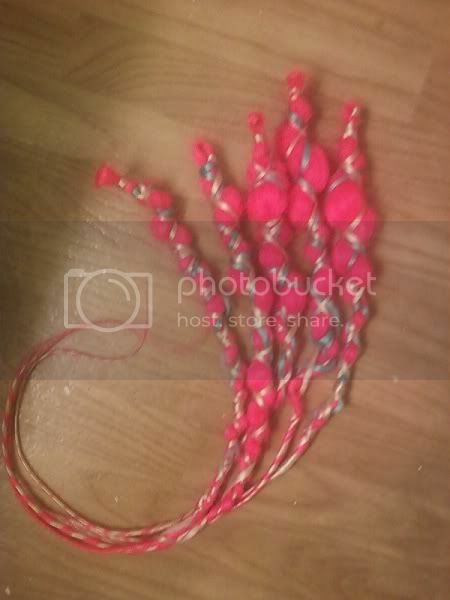 They are hot pink wrapped with light blonde and baby blue. definitely!! the normal dreads are actually going to have lilac in them so I guess it works out haha! !